We have this combo that never fails to come out perfect. I’m thinking they all originally came from the Colorado Collage cookbook, from the Denver Junior League, or maybe just two out of the three did. But they work together both on the plate and during preparation. 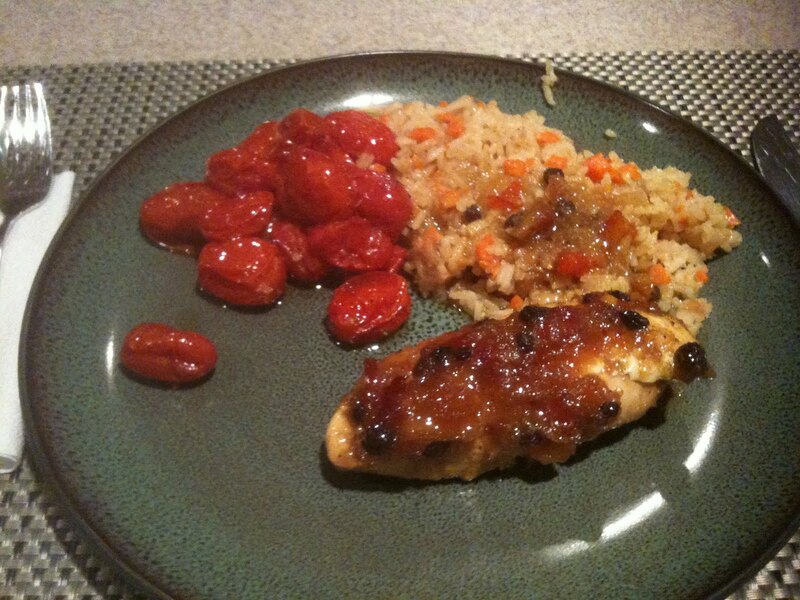 The combo is a mango chutney chicken, with a rice pilaf and oven-roasted tomatoes on the side. You prep the chicken, bake it for a while, cover it with chutney and finish baking it. While it’s baking the first time, you prep the rice and tomatoes. You put the rice on the stove and the tomatoes in the oven during the chicken intermission. And there’s no hands-on for the last ten minutes or so, so you can get everything cleaned up. Henry Ford would be proud of the assembly line efficiency. But here’s the one thing I don’t like about the ensemble: the mango chutney. Now, I love mango chutney, or just about any type, for that matter. But come on, five or six bucks for the tiniest jar. And those jars. They typically have a tiny mouth that keeps you from sticking a spoon in there, but also a curve in the bottle that keeps a knife from getting the last ounce out of the jar. If I’m going to pay five bucks for a jar of something, I’m going to get every drop onto my plate. 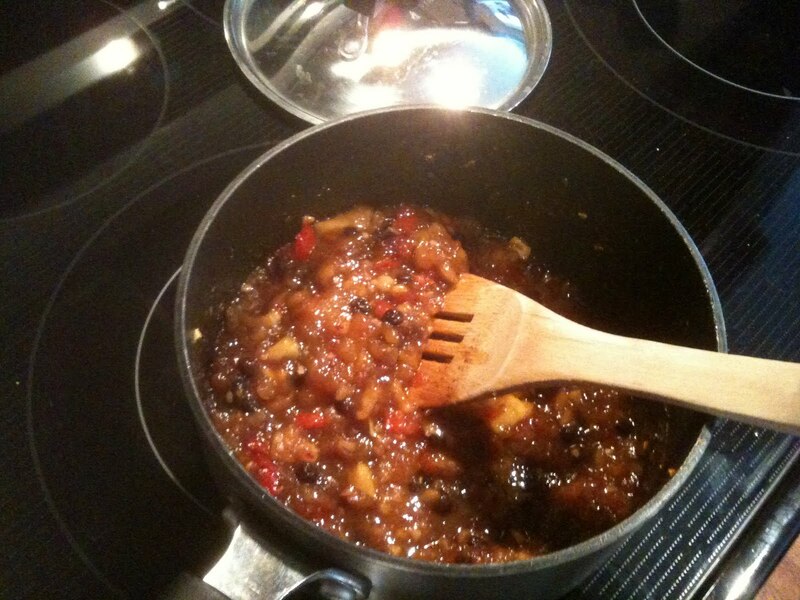 I just assumed chutney was some terribly difficult thing to concoct. It’s sort of like jelly, so there had to be boiling of jars and canning and vacuum seals, right? If I had been thinking more clearly, I would have realized that it’s more like cranberry dressing, and our cranberry chutney takes all of about five minutes to whip up. So I took the time to actually read the instructions for a mango chutney that’s in The Dutch Oven Cookbook, by Sharon Kramis and Julie Kramis Hearne. Super simple, it turns out … but … for whatever reason, this recipe, like nearly every other one out there, calls for a metric ton of mangoes and a few dozen onions, and makes enough to feed the Royal British Air Force. Not sure what the thought process is there … maybe because it freezes well, so you can jar 9/10ths of it and pull it out as you need it. Next time I may try the Dutch oven version that makes six cups, but there wasn’t room in the freezer thanks to chili and stew, so we whittled it down to about six servings. Like all good non-recipes, the details aren’t important and nearly all of the ingredients are negotiable. Heck, leave out the mangoes, for crying outside, and make it with apples or whatever. Go heavy on the red chili flakes, or leave ’em out. Add nuts, like pecans or macadamias. Add cardamom to the curry powder, or try it with green or red curry pastes. Lots of ways to play around with this one. In a large saucepan, heat the olive oil over medium heat and then add the onion, garlic, mango, red pepper, currants, and ginger. Sauté for 4-5 minutes, then add everything else. Continue to sauté on medium heat for about ten minutes, stirring frequently. Then lower the heat and simmer on low for about an hour. Cool and serve. Will store for about a week in the fridge or longer in the freezer. 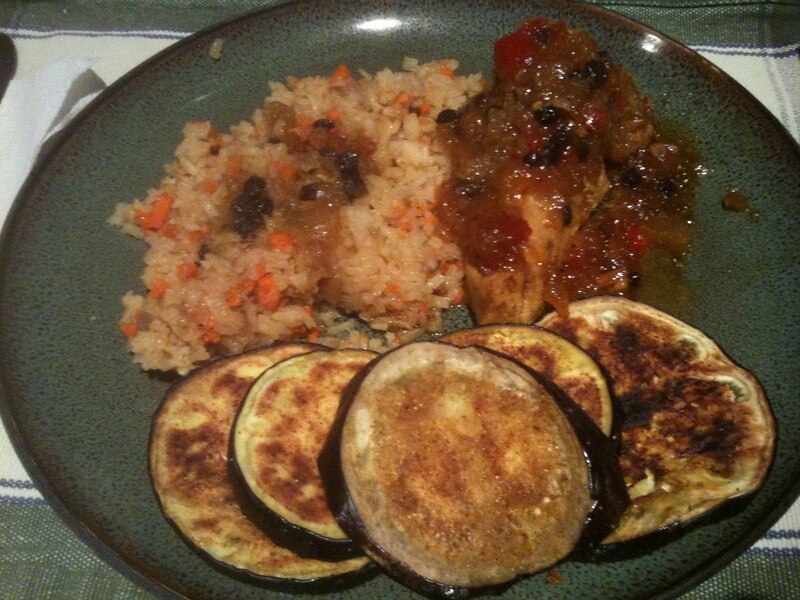 This entry was posted in chicken, chiles, chutney, Indian. Bookmark the permalink. I haven't made mango chutney in a LONG TIME! I'll have to try this recipe! Mango chutney is something I never thought to make at home. It looks easy enough and really delicious, especially on the chicken! You know where I learned to love mango chutney of all places? in Iraq. They used to have a cup of chutney on every table at every restaurant. (I dont know if they still do that, that was over thirty years ago)Anyway, I love chutney and I love the idea of cooking chicken with it or having a dollop next to it, but like you I refuse to buy the pricey jar. So, thanks to you I don't have to and can easily make some, mangoes are in right now.